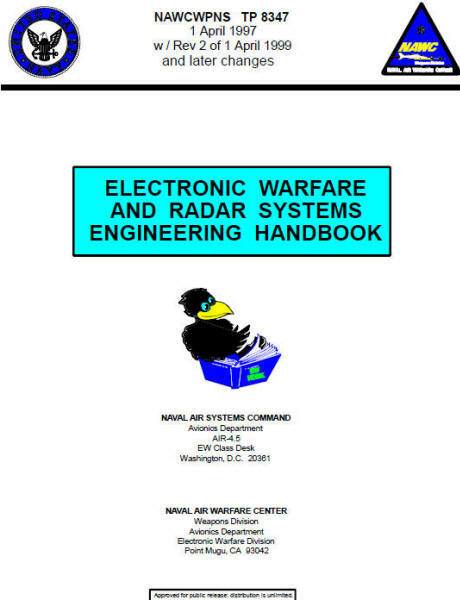 For a long time, the Electronic Warfare and Radar Systems Engineering Handbook was very difficult to locate unless you knew right where to go. Over time, some websites had been posting the file on their own servers, but it is a pretty big PFD file, and it really has not been very well indexed by Google or Yahoo or the other search engines. Therefore, I have broken it into smaller parts and posted it in HTML format. That will make viewing specific chapters much faster and easier. 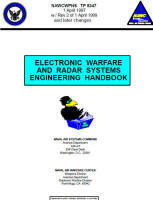 The Electronic Warfare and Radar Systems Engineering Handbook was published by the U.S. Navy's Weapons Division Avionics Department Electronic Warfare Division, Point Mugu, California, and is in the public domain, so copying is permitted so long as modifications to its content are not made without permission; however, this entire HTML version represents a lot work on my part and may not be copied. You may print the pages, but may not reproduces these pages on another website. News Flash: An updated version was published in 2013. Not a whole lot of content seems to have been added.